What is the future of mobile services? In order for mobile services to achieve the scale, scope, and agility required to keep them relevant and successful, a number of fundamental technical and business challenges need to be addressed. 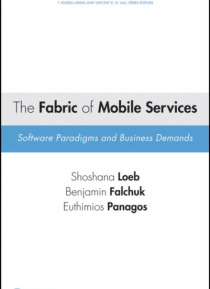 The Fabric of Mobile Services provides readers with a solid understanding of the subject, covering short-and long-term considerations and future trends that will sh… ape thistechnological evolution. Beginning with an introduction that brings readers up to speed on the mobile services environment, the book covers: The business of mobile services Mobile user location as a service enabler Simplicity and user experience The always-on infrastructure challenge Underpinnings of mobile opportunism Design patterns for mobile services Advanced services of today and tomorrow Complemented with case studies and end-of-chapter summaries that help facilitate readers' comprehension, The Fabric of Mobile Services is essential reading for researchers, engineers, software engineers, students, and anyone working in the mobile services industry.